Google is helping us in many ways. I fear that I have addicted to Google products. Please read this blog about Google's role in Mr. David's marriage planning. Yesterday I wrote that "I believe these gains would not be held in July. So please do not make any medium term purchases today". Today all international markets are down. Nifty expected to tank atleast 3 per cent. 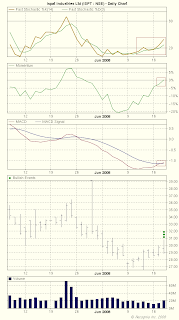 If Reliance goes down substantially then the downside risk is still higher. Today market is full of rumors. The subject ranges from PM's resignation to Ambani brothers new war. To quote a sample following is the IM received from my friend working at a local brokerage. armaan sharma: ALERT on’t buy any stock………sell sell sell sell……..ICICI BANK @ 683 too….110% will crash to kiss 650--------640 in hrs…major selloff on card…delivery selling on card from HSBC on card………..yes major negative news on card…..why Mr.KAMAT in newyork ??????? ?Pls sell…..will crash to kiss 550 next week ! !Sell all bank stock……………………………..sell sell sell !! 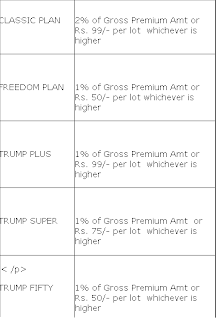 Religare actually charged it's customers @2.4% of option premium, which I think the highest in India. Now it has sent an email indicating that brokerage structure for trading in options segment has been revised and new simplified slabs would be applicable with effect from 30th June, 2008. As STT computation methodology already changed, it would help religare customers to trade morein Options. 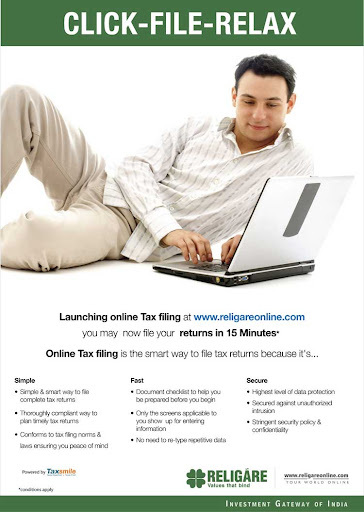 Religare and Taxsmile offers the facility to e-file Religare customer's tax returns. For more information click here. ICICI Bank, announced the launch of the ICICI Bank ‘Platinum Identity’ Credit Card. -‘i-Assist’ - A round-the-clock, complimentary service that provides assistance with Travel and restaurant reservations, gift arrangements, event tickets, and more. Even in this uncertain times, Shirpur Gold Refinery Ltd exhibited Upside Breakout in the charts. You can buy in small lots for a target of Rs.95. Torrent Pharmaceuticals Ltd also turning up. 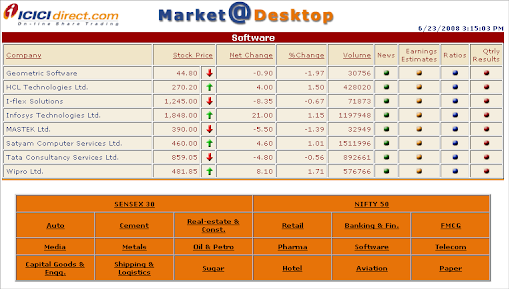 ICICIDIRECT introduces Market @ Desktop facility which gives price and fundamental information on highly traded Indian stocks in a single screen. Very useful for investors. eBay.in presents a 10% Cash Back offer exclusively for ICICI Bank Internet Banking Customers. Buy any item on www.ebay.in using ICICI Bank Internet Banking and get 10% of amount credited back in your account. through ICICI Bank Internet Banking during the Program Period. This offer ends on 19.07.2008. For detailed terms and conditions visit here. Credit Card Security Code is a feature to increase the protection against credit card fraud. Typically in the internet transactions you will be asked to type card No., Cardholder's name, expiry date and CVV2. In India, if you make any merchant transactions ( physically presenting card), most of the transaction confirmation receipt contain all the above information except CVV2. 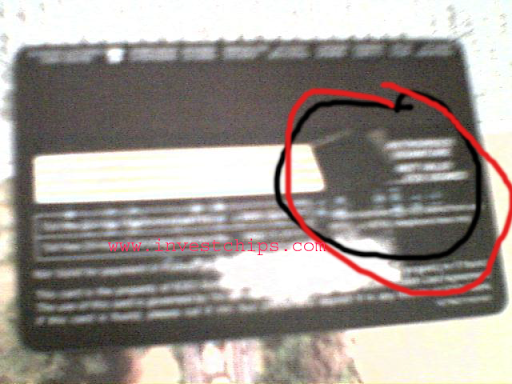 CVV2 number (last 3 digits as shown in the picture) is located in the signature strip. In the pretext of verifying your signature, the billing staff can note your CVV2 No. and can use it on internet. ( All other needed information can be noted from transaction slip at his disposal). So you memorize the number and place a black sticker on the last 3 digits as indicated below. This would you protect you from credit card frauds. text from pages you are browsing, take notes, and post to your blog. hosted on your own server. implements the MetaWeblog API is implicitly supported by ScribeFire. Asian markets are down today and owing to Indian Political uncertainties the market all poised to go down. But savvy market operators may try to squeeze the short sellers ( only positive thing in sight) which would push the Index up albeit for short term. Hence the volatility here to stay. Investors are advised to stay away from the market and Trader can play with stop loss as the market would swing either way. Data indicates gradual shorts building Up in July Series. 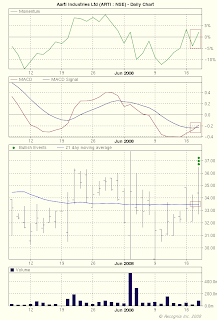 Markets are expected to be very volatile in the coming week. 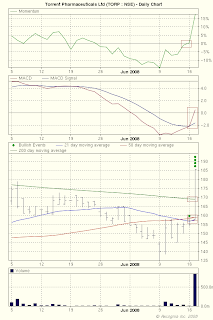 Don't short in current series as pull back rally is expected at any time. I already mentioned about Tax Smile for a comprehensive service on online income tax return preparation and filing. Another company called Tax Spanner also engaged in the same business. It is less costlier than Tax Smile but their services are limited. Only online filing is supported currently. Please visit FAQ & services not included page before registering with tax spanners. Kindly note that INVESTCHIPS or me are not paid any money for writing about different financial services. I am also not a member of any Referral program except Google's ADSENSE. 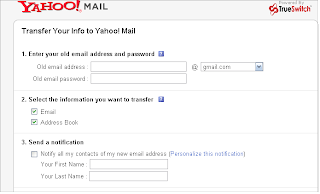 If you are fed up with Gmail, Hotmail and AOL mail and wanted to switch to Yahoo, Yahoo now gives two more domains to register. True Switch helps the migration painless and smooth. It imports all the messages and contacts to your new yahoo A/c. It also informs your new email address to all your contacts (optional). It is free for Yahoo customers. Then Why are you waiting. Following are the calls received from ITIFL . Check yourselves. Because of the political uncertainty and the inflation data release, Today's market would be very volatile with downward bias. Though international markets are giving mixed cues, local factors pointing south. As risk and volatility rise, investors should stay away from the market. Remember to check battery, electrical wiring, headlights , tyres, engine, wipers and the underbody anti- rust coating on a regular basis. Tyre pressure, tread depth and spare wheel should also be checked. Replace cloth floor mats with plastic/ rubber mats as it avoids dampness and bad odour. Avoid driving when it is pouring heavily . But if urgent, drive using first gear only and avoid using full accelerator. Lower your window panes while driving through water logged areas. If the car stalls in between, do not try to push start or crank start. It is advisable to get technical help and towing the vehicle to the nearest authorized garage. Avoid parking the vehicle near a newly built compound wall or under big trees, as storms or heavy thundershowers may collapse them. A well equipped first aid kit with bandage, pain relief spray, antiseptic cream, anti-allergics such as Avil and Aspirin should be kept handy, also carry umbrella / raincoats. People with serious illness should carry their prescribed medicines while traveling. In case you are stuck, park your car and look for the nearest garage. Be prepared to carry a list of the name of garages. It is also advisable that you create the ICE (In Case Emergency) number in your cell phone so that incase of an eventuality near ones can be informed. Also store emergency numbers of hospitals, police stations, fire stations etc. 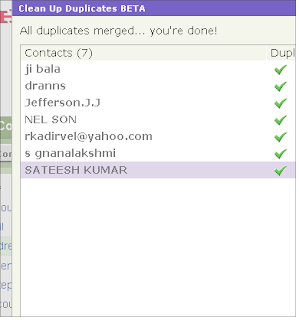 Yahoo mail Beta introduced a cool feature to remove duplicate entries and merge similar entries in your address book. This is a Great feature which is not available in Gmail. 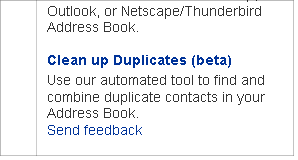 Visit http://address.mail.yahoo.com/?A=o to remove your duplicate entries in your address book. World's best open source web browser is getting better now. Mozilla Firefox version3 is about to be released today. Download it to help the Mozilla to create a new world record. Is it right time to invest in pharma sectoral Mutual Funds ? 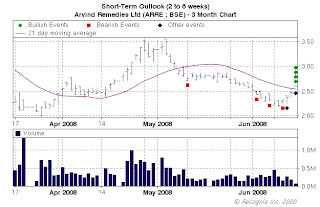 Of late Pharma sector is buzzing and all self certified analysts saying that this sector is recession proof. Every time there is excessive optimism surrounding a sector in general or a stock, it is always difficult to get through to investors. So overtaken are investors with the lure of making easy money that they refuse to be rational. Common investors continue to remain invested till all the hype surrounding the sector/stock has peaked and subsequently waned. In the process, we, the investor, probably make a return that does not compensate for the commensurate risk. If you invest through Mutual Funds, then the risk should be substantially lower than direct exposure and returns should be consistently reasonable for atleast 5 years. None of the sectoral scored in this count. Previously hype around IT sector and Infrastructure. They didn't perform well. You are well off in investing in the diversified mutual funds (esp. through SIP). Because the fund mangers is under no compulsion to hold a sector which has no value. But a sectoral Mutual fund manger could not park the money outside the sector. Don't carried away by hype. History repeats. If you still wanted to invest then make sure that your exposure to any sector didn't exceed 10 percent of your portfolio. If you are a online customer of any of the newly started online trading sites, then you would have experienced the "in process" order problem. When you place any buy or sell order or modifying orders already placed, your brokers status window show as the order status as "in process" for several hours. You can't modify or delete the 'in process' order. Last year I encountered this problem @ Religare, I altogether stopped trading there. But today I had this problem @ Reliance Money. (It is the first time). I am using Reliance Money Insta Trade which is the fastest platform available with them. Today I bought Nifty4500 Puts. I placed square off limit order @ Rs.69.50 around 11am. As market is gaining ,my put starts losing it's value. I tried to modify that order. Modify order page was not loading. Then I tried to delete my order. The oder status turned to "in process" . My un booked loss started to mount. Out of frustration I shutdown the computer and went out. ( You may ask me why didn't you contact the customer care? If you contact them by email, their customer care official contact you only after 15days, by the time you would forgot the original problem). Reliance money should improve reliability of their system and customer care. Happy end to the story. The order didn't got deleted and executed @69.50 in the afternoon and gave me around 15% return intra day. But this would not justify Reliance Money's erratic trading platform. ( some times it may be due to problem at NSE). Reliance money should learn about customer service from India Infoline. Yesterday I authorised Feed Burner to handle Invest Chips feed management. The new feed url is http://feeds.feedburner.com/InvestChips . If you have any problem in accessing investchips in your reader, Please re subscribe with this new feed url . Reliance Communications’ (RCom) merger talks with South African major MTN could be in trouble reports the Businessline. The rivalry between the two Ambani brothers have come to the fore yet again, with Mr Mukesh Ambani’s Reliance Industries Ltd claiming first right to the younger Ambani’s stake in Reliance Communications in the event of an equity swap with MTN. Reacting to RIL’s claims, Reliance Communications in a statement said, “Last night, in a mala fide effort to disrupt the talks, Reliance Industries Ltd (RIL), part of the Mukesh Ambani group, has sent a communication to MTN Group, making a false claim of an alleged right of first refusal to buy the controlling stake in Reliance Communications Ltd (RCom). RIL’s claim is legally and factually untenable, baseless, and misconceived.”According to sources close to the Ambani family, the two sides had agreed that the other brother would have the first right of refusal in case of a large stake sale in any of the businesses owned by either of the brothers. “Reliance Communications dismisses RIL’s claim with the contempt it deserves,” the statement said. With RCom saying that talks with MTN were progressing well, this could snowball into yet another court room battle between the two feuding brothers. The website, created by Suresh K. Sethi, CEO, RIA Insurance Brokers compares premiums offered by different companies for various age groups. The site has a lot of information on the subject and the way the industry, especially health insurance, works. A venture of Bonsai Insurance Broking, the website, apart from allowing comparison of products, allows one to seek tailored products. The website is the online venture of A&M insurance brokers, and they represent the 11 big health insurers and offer their products online. One can search for individual plans, family floaters and also critical illness through this site. This web initiative of Peacock Financial Advisors, a Pune-based financial advisory, offers solutions across insurance products. One can search for quotes on health insurance through this site. Promoted by Optima insurance brokers, the site offers comparison across insurance schemes and promises to get you the best rates. Though the site is still in its beta version, it has a wide network across the country. Insurance provides a cover against future uncertainties. Risk can be defined as a variation between the 'what is expected to happen' and 'what really happens'. An ELSS ( Equity Linked Saving Scheme) is an equity fund that invests in equity and equity related securities and which Offers tax benefit - a deduction of upto Rs.1lakhs under section 80CCC and holds a lock-in period of 3 years. I recommend both the schemes. Invest through SIP. Social networking sites have become the part and parcel of youth's life. And Youtube probably ranks the highest among those. But people face technology handicaps to shoot and share a video. However, making a powerpoint presentation is quite easy. People can make a video out of their powerpoint presentation and can upload the same on youtube or ipod or put it in blog or on a website. These three steps guide will tell you how a presentation can be converted into a video without any hassles and free of cost. You can upload these PowerPoint video files to YouTube or transfer them to your iPod and watch them on the move. Or you can burn the video on to a DVD and watch the presentations on a large TV screen. To get started, all you need is a copy of Microsoft PowerPoint (XP,2003,2007), the PPT file, microphone (if you want to record audio) and Internet access. It is all free. Visit http://www.authorstream.com/. For Help http://www.authorstream.com/help/Welcome . No more E-cards, Send Personalized Paper Greeting Cards now, Online! PAPAM is dedicated to deliver Personalized Greeting Cards at the Doorsteps of the recipient. A very simple concept of sending Greeting Cards to one's Friends and Family is presented with loads of value adds. Company has already some corporate clients registered with them. "Your Relations are Unique. You define Them." - This is the philosophy behind www.papam.in, a company dedicated to capture the very basic emotional need of creating, connecting and cherishing the bonds with Friends and Family. Greeting Cards have always been favorite to fulfill this need. PAPAM has eased out the entire process by providing a virtual platform to Select and Send Greeting Cards from a unique and rich design gallery. Card costs starts approx. Rs.37. You can pay online. The stock of Mumbai-based Griffin Chemicals shot up by 3,900 per cent on Wednesday in the first hour of trading on the Bombay Stock Exchange (BSE). The share was being admitted for trading for the first time in five years, after it got de-listed in 2002 for non-compliance issues. On its last trading day in that year, the stock had closed at Rs 1.25 a share. Griffin Chemicals rose to touch a high of Rs 50 a share, a 3,900 per cent gain, after getting re-listed at Rs 23 a share. Falling from its peak, the stock closed the day at Rs 24, a gain of 1,820 per cent. It's a third penny stock which witnessed a brazen price rise after KGN and Sylph Technologies made headlines on the first day of their re-listing. An email received from my friend. Following is the article from well known Newspaper. Find the detail break-up of the Final price of petrol available in pumps. details are for per liter petrol in Rs. For Rs 22 per liter at petrol pumps, we people paying Rs 28 tax extra. crude oil bubble in International oil crisis. Birla Sun Life MF launched Century SIP, a unique systematic investment plan offering an opportunity to create wealth with as little as Rs .1000 Per month plus a life insurance cover of up to 100 times the monthly installment.This plan comes along with free term insurance for an individual up to 55 years of age. The life insurance cover comes at no extra cost to the investor. The cover is hassle free. The investor need not go thru any medial test to avail of the life cover. All an investor needs to do is enroll for CSIP & sign a “Declaration of Good Health”. In case of unfortunate demise of investor the insurance claim will be directly paid to the nominee by the insurance company (Birla Sun Life Insurance Company). Insurance cover to the investor would continue even after the SIP’s minimum maturity tenor of 3 years. Any individual between 18 to 46 years of age may invest in this plan. However, the free term insurance for an individual is only up to 55 years of age.Investment in this plan may be made through Electronic clearing system (ECS), direct debits or post dated cheques. BSNL announces substantial reduction in tariff of Landline /WLL and Cellular service. The reduced tariff will be effective from 11th June 2008. Details may be read @ http://www.bsnl.in/newsdetailed.php?news_id=414 . Moneybhai Investor is a simulated real-time Stock Market Game aimed at giving investors an easy and interactive platform - using Television, the Internet and Mobile phones to understand and invest in the stock market without fear of losing their investment. The objective of this interactive stock market game is to educate and help first-time investors in understanding how the stock market functions. Participants need to register online on www.moneybhai.com or SMS MB to 52622 through their mobile phone to be part of the Moneybhai Investor interactive stock market game. The prize money for a daily winner will be Rs 10,000. To be eligible for the Moneybhai daily prize it is mandatory to log in to your account at least once a day. The prize money for a weekly winner will be Rs 25,000. To be eligible for the Moneybhai weekly prize it is mandatory to log in to your account at least thrice a week. The prize money for a monthly winner will be Rs 50,000. To be eligible for the Moneybhai monthly prize, it is mandatory to log in to your account at least 4 times a month. Top 5 players to win exclusive 18-piece Magpie Cutlery sets daily. The winner needs to pay the gift tax, VAT and other incremental expenses as applicable. It is a risk free way to learn the stock market and if you are right it would fetch you money too. Suzlon Energy, which opened on a negative note this morning, has rallied sharply to Rs 268.70, netting a handsome gain of 2.65%. But caution advised. Suzlon Energy Ltd., said Edison Mission Energy has cancelled an order for 150 turbines. The US energy major has decided against buying the 2.1-megawatt turbines that were due for delivery in 2009, Suzlon informed the Bombay Stock Exchange. The cancalled order represents the second phase of the 300 turbine order. Edison has cancelled the order after blades, which were supplied by Suzlon, started cracking due to design problems. Suzlon had recalled 1,251 blades from its turbines. The company has also reportedly spent $30 million to repair cracked blades. Reuters also confirming the same.